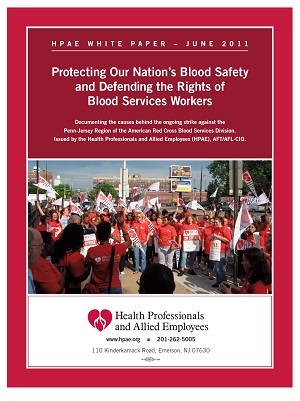 Our union, Local 5103 of the Health Professionals and Allied Employees, AFT, AFL-CIO (HPAE) representing Registered Nurses and Donor Collection Assistants are in the midst of a labor dispute with our employer, the American Red Cross Blood Services Division, Penn-Jersey Region. HPAE Local 5103’s contract with the Red Cross’ Penn-Jersey Region expired on May 22, 2011. We want to tell you about the work we do.We want to alert you to concerns we have about the Red Cross’ policies and practices we believe jeopardize the safety of donors and the blood supply and violate workers’ rights and dignity. Our members went on strike in Philadelphia and New Jersey on May 24th after two months of negotiations with the management of the Penn-Jersey Region. Central issues for our members are staffing, scheduling, training and conditions we believe jeopardize the safety of workers, donors and the blood supply. At local negotiations, Red Cross demanded that the union waive its right to bargain over health care, a demand that Red Cross has been making in negotiations across the country. In order to avert a strike, we asked that this issue be resolved through binding arbitration. Red Cross refused. Red Cross’ demand that we waive our rights to negotiate over health care coverage before they would address our safety concerns is at the heart of what forced our members to go out on strike.